Chinchilla vs Guinea Pig – Which Is The Best Pet For You? Home Chinchillas Chinchilla vs Guinea Pig – Which Pet Is Best? Chinchilla vs Guinea Pig – Which Pet Is Best? Choosing between a guinea pig or chinchilla is a really tough choice! They are both so cute, so adorable, so lively and so fluffy! How will you ever make up your mind? Well, you are definitely not alone in your chinchilla vs guinea pig indecision. In fact, as you read on, you will learn that this is one of the “great debates” among pocket pet enthusiasts today! In this article, we aim to give you the best, most updated and accurate information about the chinchilla and the guinea pig. So you can decide if a chinchilla or guinea pig is the better fit for your lifestyle and family! Chinchilla vs Guinea Pig – The Great Debate! We don’t know precisely when the chinchilla vs guinea pig debate began, but it shows no signs of stopping any time soon. In this scenario, a chinchilla is an apple and a guinea pig is an orange. For this reason, trying to compare them point-for-point is never going to be an easy task to tackle. But what really does work well is to take a look at the temperament, housing, space, climate, food and socialization needs of a chinchilla and guinea pig each in turn. Then you will know what each type of pet requires in order to thrive. And you can compare their individual needs with what you currently can offer a small mammalian pet. 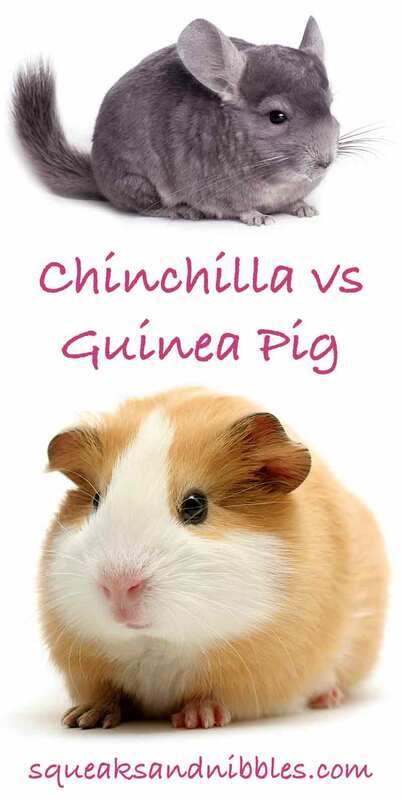 This is actually a great way to make a wise and informed decision about whether to choose a chinchilla or guinea pig! A guinea pig and chinchilla share some interesting similarities. So much so that it is still not uncommon for some people to call them a chinchilla guinea pig, like they are one and the same animal. But while both the chinchilla and guinea pig originally hail from South America, both are furry mammals. And both are generally classified as “pocket pets” in the pet industry, the two start to appear less and less alike the closer you look. So let’s take a closer look and see what there is to be learned about the similarities and differences of each! This is due to their large ears and bulbous heads, plus their short front legs and powerful hind legs, and their tendency to hop and leap about. Amazingly, every single chinchilla in captivity today can trace its ancestry back to 13 original chinchillas brought to the United States in 1927. Originally domesticated in service to the fur trade, it didn’t take long for fur traders and their patrons to notice how cute these little furry handfuls truly are and start keeping them as pets as well. Wild chinchillas, of which there is still a hearty population, live in high, barren, cool areas in the Chilean Andes mountains. For this reason, they cannot tolerate temperatures above 80 degrees Fahrenheit (26.67 degrees Celsius) without a significant risk of fatal heat stroke. Chinchillas are not at all tolerant of drafts, dampness, or direct heat sources. Humidity above 40 percent can be deadly to a chinchilla. They are fairly fragile in this way, and can be difficult pets to maintain if you do not live in a geographic area with a complementary climate to what they would find in a wild setting. In the wild, chinchillas are very social and like to live in large groups. In captivity, they are best housed alone. Unless you are breeding them or you have a pair of same-gender cage mates who have been together since they were little. Otherwise, they may fight. Chinchillas are quite long-lived, often reaching the age of 20 in captivity if all basic care needs are consistently met. An adult chinchilla will usually weigh between 400 and 600 grams (0.88 to 1.3 pounds). Females tend to slightly outweigh males. In length, an adult can range from 8 to 12 inches. Chinchillas tend to be quiet and shy. They are largely crepuscular (active at dawn/dusk), although in captivity they may be awake during periods of daylight. They are sweet and smart, but can be high-strung. Unlike guinea pigs, they don’t usually vocalize, which some pet owners prefer. Particularly since chinchillas get more active around dawn and dusk when some people enjoy sleeping. Chinchillas are herbivores, which means they eat plant matter. Their digestive tract can handle lots of fiber, which they need lots of to remain healthy. They are odorless pets and do not bathe in water; rather, they need powder for bathing. However, they do need constant access to clean drinking water. Chinchillas do best with a diet of chinchilla pellets with the very occasional treat of raisins, which they absolutely love. Choose any other habitat than wire, and you may come home one day to a thoroughly chewed habitat and a MIA chinchilla. For this reason, they need a sturdy wire cage with a smooth bottom – mesh or wire bottoms will hurt their feet. They also need a cage that offers at least two square feet of floor space along with sufficient height for hopping, climbing and jumping, which chinchillas excel at and truly enjoy. Chinchillas also need constant access to a place to hide and rest that keeps them out of sight. This hiding spot doesn’t have to be elaborate – a simple coffee can or empty tissue box will do nicely (at least until the latter gets chewed up!). Speaking of which, chinchillas just cannot resist chewing and need continual access to chewable materials and toys. Wood and pumice stone are particularly good for teething and gnawing. If you do let your chinchilla out of the cage for playtime, be sure you have THOROUGHLY chinchilla-proofed the room and secured all exits. They are natural escape artists and will also eagerly chew on electrical cords and other very unsafe household materials. Chinchillas need a special type of bathing powder provided as often as daily. They also need to stay clean and dry at all times or their fur may grow a health-damaging fungus (to learn more about this unique health need of powder bathing, be sure to review this informative article). Chinchillas require access to chewing materials constantly. If a captive chinchilla cannot chew, its teeth will keep growing until they eventually cause injury or death. Chinchillas tend to be fragile physically with their slender small frames. The only correct way to handle a chinchilla is to pick it up by its body, supporting the entire body as you do so. NEVER pick up a chinchilla by its tale! This is vital to know, because with improper handling, a chinchilla may exhibit a defensive anti-predator tactic called a “fur slip.” Here, the chinchilla will shed a large patch of fur, hoping to slip out of your grasp. 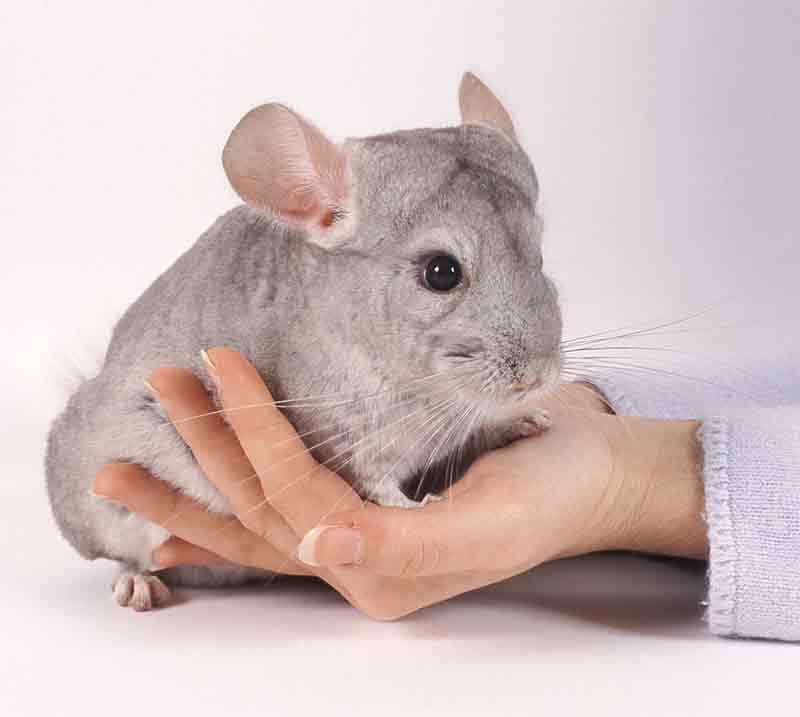 This fur loss doesn’t necessarily hurt your pet, but it can take months to grow back and may expose the chinchilla to more temperature sensitivity. Chinchillas have a naturally nervous temperament, as most small, tasty prey animals do. They need consistency in their habitat, daily routine and overall environment or they may become so stressed they fall ill.
A guinea pig, scientific name Cavia porcellus, is a small to medium-sized furry mammal in the rodent family. Cuy are very important in the ancient traditional Chilean Andean culture for their fur, meat, and medicinal value. 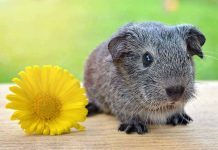 For modern western medicine, too, guinea pigs have become so widely used as laboratory animals that they can take all the credit for the phrase “being a guinea pig,” which means to be a participant in medical research studies. In the wild, guinea pigs, or cavies, live in large units that usually contain just one alpha male and several females. In captivity, the best strategy is to house a single breeding pair of guinea pigs together. Or if you don’t want baby cavies, to house two same-gender pigs together. If kept alone by itself, a captive guinea pig may fail to thrive. Especially if you are gone for large portions of the day. As with chinchillas, the first guinea pigs may have initially showed up in captivity for their nutritional or medicinal value, but like with chinchillas, guinea pigs are also very cute. So it clearly didn’t take long for these little furry rodents to find their way out of the labs and dinner plates and into the laps and hearts of pet lovers around the world. In the wild, guinea pigs are called cavies (short for their family name, Cavidae). They are largely nocturnal and live in family units of up to 10 pigs. They prefer rocky, grassy or even swampy areas near tracts of forestland or open savannahs. Their preferred temperature range is 65 to 75 degrees Fahrenheit (18.33 to 23.89 degrees Celsius). They are more tolerant to cold than heat. Their tolerance to excessive damp is low, as is their tolerance for being left alone without companion cavies. Wild cavies are great burrowers. They live and nest underground, often building complex series of interconnecting burrows where they can store food and find shelter from their many predators. A healthy guinea pig may live as long as 8 years providing all captive care needs are consistently met. An adult guinea pig generally weighs between 680 and 1,180 grams (1.5 to 2.6 pounds). Like chinchillas, they tend to range from 8 to 12 inches long as adults. Guinea pigs are known to be sweet tempered and laid back so long as everything remains consistent in their habitat, food and daily routine. They can be quite vocal, making squeaks and calls to their owners and cage mates. But they do not like change, and so every effort should be made to keep your pig’s life as predictable as possible. Guinea pigs very rarely nip or bite unless they are improperly handled or very frightened. Owners also say pet pigs often develop very unique personalities just like cats and dogs! Guinea pigs are herbivores (plant eaters). They need constant access to water and will drink frequently. They can’t make their own Vitamin C (just like people), so they need enriched food. 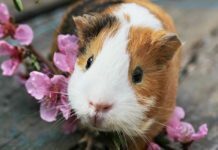 One common question among new guinea pig owners is “Can chinchillas eat guinea pig food?” The answer is a simple “no.” Guinea pigs need to have their own specially formulated pellets with extra Vitamin C fortification. On that topic, guinea pigs do best with a diet of guinea pig pellets, with timothy hay, occasional alfalfa and green Vitamin C-rich veggies for supplementation and treats. You will want to use heavy dishes for your guinea pig’s food and water so the dishes don’t tip over. It is important to continually clean both dishes, as sometimes guinea pigs can mistake a food or water dish for a toilet bowl! Guinea pigs need a smooth-bottom cage or habitat. Wire or mesh bottoms will hurt a pig’s sensitive and tender feet. Wire is definitely the cage material of choice because it is resistant to chewing and gnawing. Guinea pigs also need plentiful floor space for running and exercising, but they don’t really need height, since they do not climb at all. 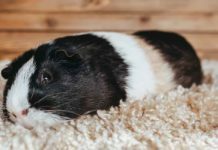 Each guinea pig should have at least 7 square feet of personal floor space (for more on habitat space requirements for single and multiple piggies, please review this informative article). Because they come from a long line of burrowing rodents, your guinea pig will have a strong innate need for constant access to a safe hiding space, so one should be provided at all times. Like chinchillas, guinea pigs need to chew. Wood or bone toys are both great chewing choices to keep your guinea pig’s teeth in check. Before you let your piggie out for playtime, be sure you have removed any and all electrical cords, secured the sockets with childproof covers and blocked all exits. Escaped pet guinea pigs can be very tough to recapture! Guinea pigs need regular nail trims to keep their feet healthy. As well, if you choose a guinea pig with long fur, you will need to groom the fur at least weekly to prevent matting. As with chinchillas, guinea pigs have teeth that grow continuously. Gnawing and chewing on materials and toys is the only way a captive pig can keep their own teeth from growing too long and potentially hurting them. Can chinchillas and guinea pigs live together? Because chinchillas and guinea pigs share some similar features, it can be an easy beginner’s error to assume they can safely share housing. 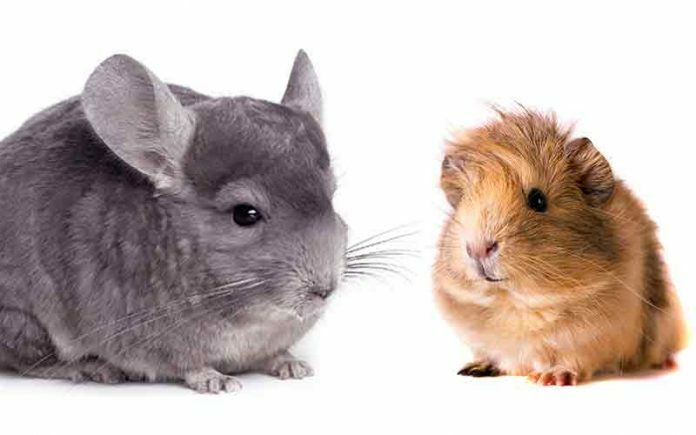 In fact, it is a great question to ask – “Can chinchillas and guinea pigs live together?” But for each species’ own safety and wellbeing, it is simply not advisable to house chinchillas and guinea pigs together in the same cage. As well, chinchillas are largely solitary in captivity – otherwise, they have a tendency to fight with a cage mate. So it could be dangerous to house any other animal with a chinchilla, even another chinchilla, unless both animals are closely supervised. Can chinchillas eat guinea pig food? Here again, it is vital to remember that guinea pigs, like humans, cannot manufacture their own source of Vitamin C.
For this reason, guinea pig food must be specially formulated with extra Vitamin C that chinchillas and most other pet animals do not need. As well, each blend of pelleted food will be precisely formulated for the needs of each species. And for that reason it is not possible or even safe to share food between the two species. Guinea pig or chinchilla – a better pet? As you read through all of the information here, it is easy to see why the guinea pig or chinchilla better pet debate is a still unresolved! It is a very tough call to make! Sometimes it can be really helpful to make a “pros and cons” list to help yourself make difficult choices like this one. So here is a general list outline you can personalize further for your own family’s great debate and decision! Very long potential life span. Quiet (doesn’t vocalize day or night). Odorless, so can be great for those with allergies. Can be housed alone, so no need to get a second pet. Needs a large but high cage, which won’t take up a lot of floor space. Known to be fairly hardy health-wise – tooth growth is a main health issue. Crepuscular (active at dawn/dusk), so may keep light sleepers awake. Somewhat high strung and may nip or bite, especially if startled or mishandled. They need a VERY exacting environment in terms of humidity and temperature – going above 80 degrees Fahrenheit (26.67 degrees Celsius) is fatal for a chinchilla. If housing two chinchillas together, it is always necessary to have a second cage standing by just in case, because their moods can shift and they may fight. Generally hardy when handled so long as you learn to pick your pig up properly. Very sweet tempered and sociable. Loves to vocalize, which many pet owners enjoy. Generally easy to feed and care for. Pees a LOT and may smell even with daily cage cleanings. Can be messy with peeing and chewing and the cage will need frequent cleanings. Needs a large, long cage that will take up lots of floor space. Shorter life span by as much as half. Nocturnal, so may keep light sleepers awake. Needs near-constant companionship, so it is best to get two pigs. There is really no debate here. 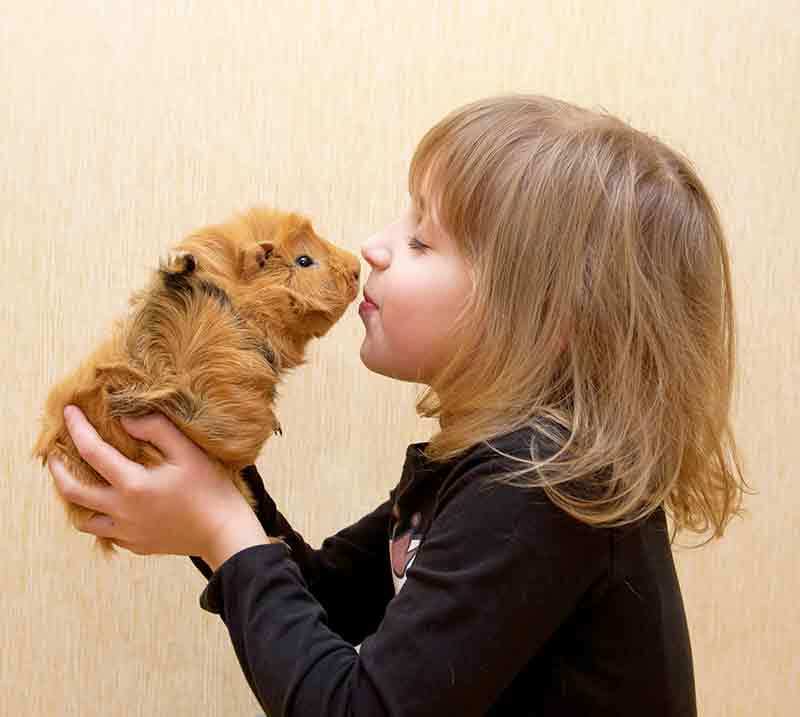 A guinea pig is generally considered to be a better pet choice for families with younger kids. A guinea pig is a hardier, sturdier rodent physically, and won’t shed out a huge clump of fur or bite if accidentally mishandled. Guinea pigs are more extroverted and social in terms of general temperament. They are actually quite cuddly and enjoy being handled. Guinea pigs are gentle and tolerant overall and have sweet personalities. They are smart and trainable with small food incentives, which can be fun for kids. With their shorter lifespans, they won’t be in a position to pine away when a child becomes busier in high school and then leaves for college or independent life. Chinchilla vs Guinea Pig – Which Should I Get? So……which pet should you get? A chinchilla or guinea pig? Choices, choices! Only you can decide, and we hope all of the information you have read about here is helping to make that decision lots easier! Once you do make your decision, we would love to hear about it! Please post in the comments section here to tell us whether you chose a guinea pig or chinchilla or another type of pet, and why, so we can all celebrate your new addition with you! Donnelly, T.M., DVM, et al, “Guinea pig and chinchilla care and husbandry,” Veterinary Clinics: Exotic Animal Practice, 2004. Donnelly, T., M., BVSc, DVP, DACLAM, DABVP(ECM), “Overview of Rodents,” Merck Veterinary Manual, 2015. Axelson, R., DVM, “Chinchillas – Owning,” VCA Hospitals, 2008. Jones Townsel, L., “Full of Personality, Guinea Pigs are Fun to Have,” The Daily Herald, 2012. Karr-Lilienthal, Ph.D., L., “Chinchilla Housing and Care,” Extension: Issues, Innovation, Impact, 2013. Next articleCan Male And Female Rats Live Together? GUINEA PIGS ARE BAE THEY ARE THE BEST PETS IN THE WORLD. Guinea pigs are the best and the cutest! chinchillas all they way, I have one and I named her Nutella (nella for short) and in the dorst 2 days I can pick her up and everything.